These are great for mounting as an extra plate on the rear of the car. Blue & red imprint on a white background. Great for mounting as an extra plate on the rear of the car. This is a die cast chrome licence plate surround, to compliment our Model A licence plates. A-13147-A to D.
This is a matt black powder coated licence plate surround, to fit most standard American licence plates. Rear License Plate Bracket in polished stainless for the 1928-1956 Fords. 1928-1956 Rear License Plate Bracket. This bracket is a reproduction but 100% original. Even Henry Ford couldn't tell the difference. Powder coated black. Made in USA. Front number plate brackets, Powder coated black. These brackets are used for attaching the front licence plate to the headlamp bar. Set of 2. Made in USA. Front number plate brackets Painted matt black. 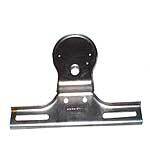 These brackets are used for attaching the front licence plate to the headlamp bar. Set of 2. Front number plate brackets in polished stainless. 1928-29 drum tail light license bracket. Steel mint reproduction. Made in USA. Accessory bolt/nut set for mounting the rear license plate to the bracket. Note: These 1/4" UNC screws are very short, so will only work with original style thin number plate. An aluminium frame with blue lettering over a white background for the USA style plates. Set of 2. Made in USA.